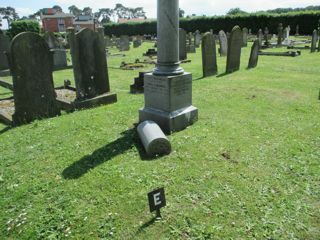 A lot of gravestones in this section are of the kerb type. They consist of a thin rectangle of stone with the inscription around the edge. Unfortunately they often sink and this, together with erosion and the linear nature of the inscriptions, makes it difficult to show much detail. Even so, I have closely examined each grave and the information given for each one is correct. The GPR holds 322 grave and 589 person records for the cemetery.